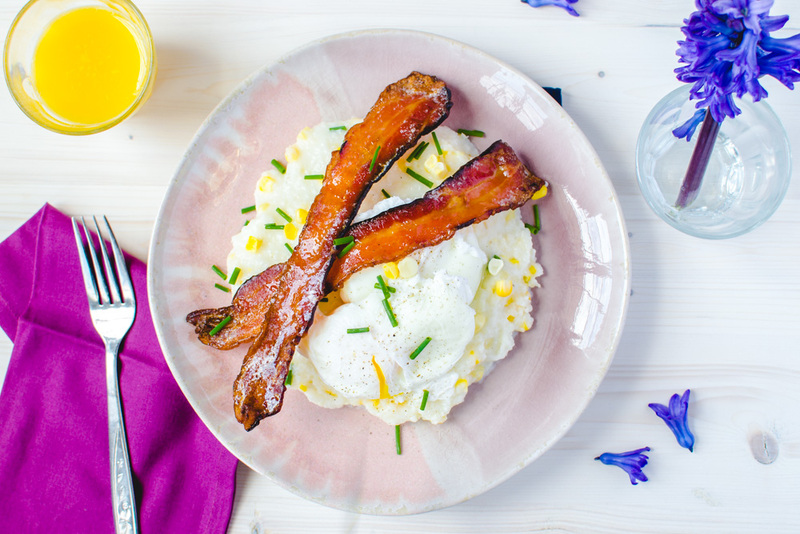 Cheesy corn grits with maple bacon and poached eggs. Maybe not something you’d think to make for breakfast off the top of your head (at least in Newfoundland), but definitely something you should try. This recipe is for the savoury breakfast lovers. The ones that die for a good brunch on the weekend. I know we can’t be the only ones. Hands up in the back! You know how sometimes you have a meal that you just can’t stop thinking about? That’s where these grits come in. A few years back I (Nicole) went to brunch at a local restaurant (Madison’s) and ordered the corn grits with maple bacon. I had never had corn grits before, but I’m always up for trying new things. Non interesting story made short: I loved them. Like loved them, loved them. I realize corn grits aren’t for everyone, they’re a bit like a porridge. I remember the waitress telling me that not many people were fans. I’m not saying this to scare you off from giving this a shot, just know your taste buds. If you don’t like regular porridge or the taste of corn, you probably won’t like this! I don’t know why it took me so long to come up with a recipe of my own. My recollection of the dish is a bit fuzzy at this point, but we came up with a delicious meal none-the-less! 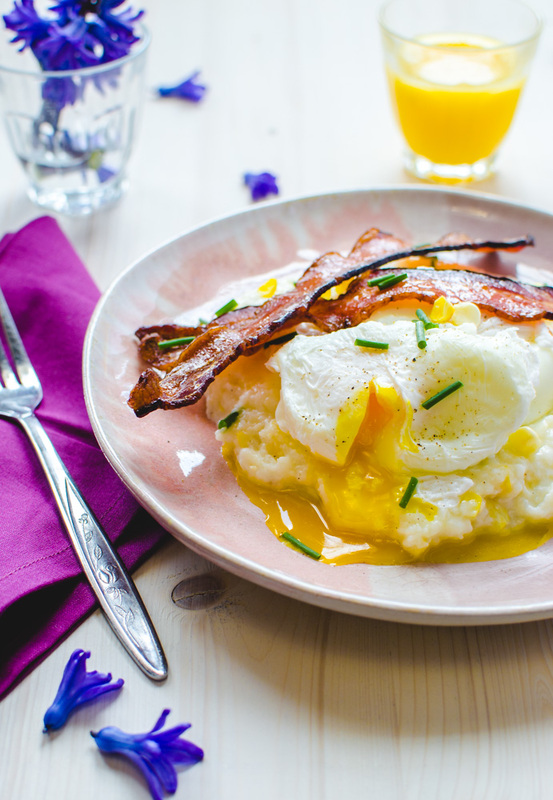 We made the grits with some old white cheddar, added some fresh corn kernels, some chives and topped it off with some sweet, crunchy maple bacon and a poached egg. We used Bob’s red mill corn grits, which you can get at Sobey’s or on Amazon. Preheat oven to 375F. Line a baking sheet with parchment paper and place a cooling rack over top. Lay the bacon on the cooling rack and cook in the oven for 20 minutes. Remove from oven, dab grease off the bacon with a paper towel and then brush on the maple syrup. Return to oven for 5-7 minutes, until bacon is crisp and maple syrup is sticky. While bacon is cooking, bring water to a boil in a large pot. Once boiling, whisk in the salt and corn grits and continue to whisk, almost constantly, for 20 minutes. Add the corn kernels to the pot and continue cooking for 5 more minutes. Grits should be quite thick at this point. Remove from heat and stir in the cream, cheddar cheese, 1 tbsp chives and freshly cracked pepper. In a separate pot, fill with water and a splash of vinegar (vinegar optional). Bring water to a gentle simmer, over medium-low heat, and using a spoon, swirl the water to create a vortex. Have your eggs cracked in separate little containers, and making sure you have a good vortex going, gently lower an egg into the water. Don't overcrowd the pot, only cook 2 or 3 eggs at a time. Cook to your liking, we like a somewhat runny yolk. I don't time the eggs, I usually remove one with a slotted spoon and gently poke the center, if it isn't too jiggly, but is soft, it is done. Add some corn grits to a plate, top with 1 or 2 poached eggs, two pieces of bacon and a sprinkling of fresh chives and cracked black pepper. Enjoy!